In recent years, the fitness industry has decided to focus a lot of time and money at getting new moms back in shape. There are mom and child workout classes, women’s only gyms that provide free daycare, and books and DVDs catered exclusively to moms. This is no bad thing, but what about dads? See, middle-aged men who have had kids are more likely to be overweight than most other demographics. 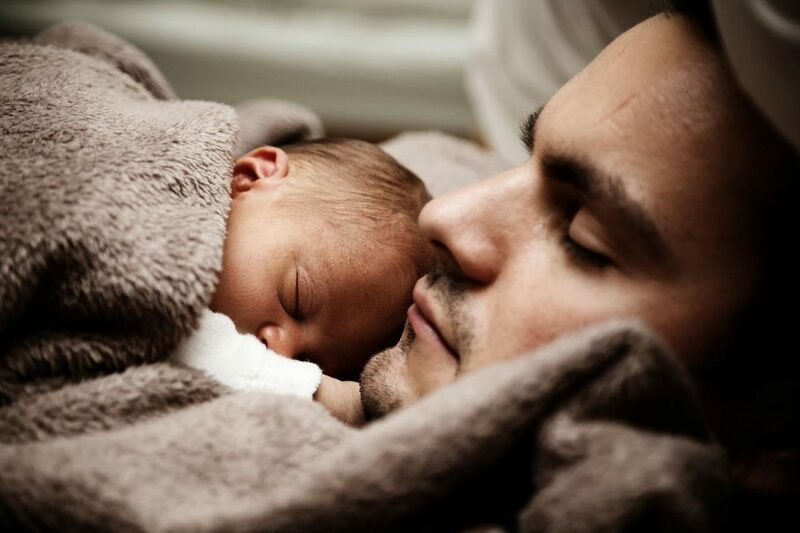 Not to get too stereotypical here (every family is different), but new dads will have to contend with long hours at the office (paternity leave is incredibly uncommon in most countries), lack of sleep, raising your child, and a busy social calendar. Because of this, it can be very hard to stay in shape. But it’s not impossible, and in fact, when properly scheduled, fitness and nutrition can actually be improved rather than ruined! 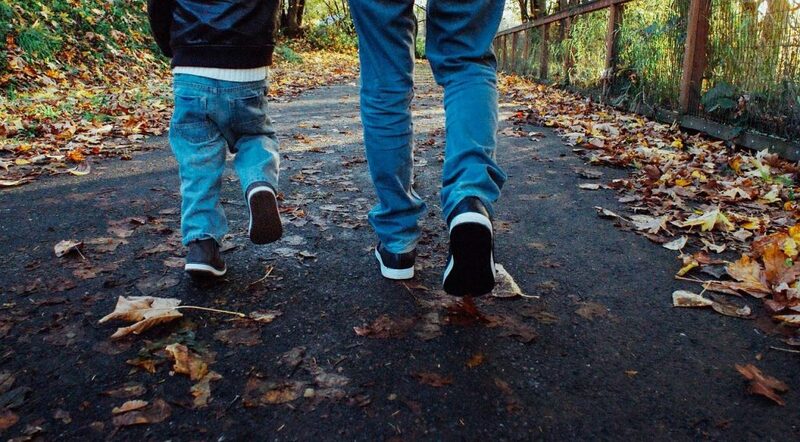 In this article we are going to look at 5 tips to stay in great shape while being a father. This first tip is not based around fitness at all, but it is potentially a game changer. You can’t train when you’re tired, studies have shown that people who have a bad night’s sleep eat higher calorie foods, move less, are more stressed, and have lower testosterone levels. This stuff is important. Of course it can be difficult, but before doing anything else on this list, try to improve your sleep quality – even if you can’t improve your sleep quantity. Try to go to bed at the same time each night, and wake up at the same time each morning. If your kids constantly wake you up at 6am, then schedule this into your day. Go to bed at 10pm, or 11pm so that when that tiny alarm clock wakes you up bright and early, you’ve had a decent 7-8 hours in bed. Consider taking natural sleep supplements, eating foods/drinks that can improve your sleep (glass of milk, casein protein, cottage cheese etc), and avoid electrical devices for 30 minutes before bed. If you’ve had a terrible night, then try to get a power nap at lunch time. Take a high caffeine pill or a black coffee and then set your alarm for half an hour. Go to sleep (the caffeine will take 30 minutes to work) and when you wake up you will feel refreshed. Making sure you get your coffee fix everyday is also very important, many people talk about making the perfect coffee, Kimbo Coffee offers classes to become a barista, so you can make the perfect coffee in no time. This morning routine can be done while your kid is watching tv, they can even join in if they want! It’s just 15 minutes long, and can be shorter if 15 minutes sounds like too much time. Keep it nice and simple, and always challenge yourself to improve on your previous performance. You can use squats, lunges, push-ups, Burpees, jumping jacks, mountain climbers, sit ups, or even weight exercises if you have any equipment. But don’t go overboard, this is a quick morning routine. You could replace the mountain climbers with Burpees, or jumping jacks, and you could replace lunges with bicep curls if you have dumbbells. Be creative, but keep it short, simple, and repeatable. It’s such a simple solution that most people dismiss it out of hand, “How can walking help me? It’s barely exercise”. But it is exercise, it may be slow, it may not burn too many calories per minute, but it still counts. Think of calorie burning like the Tortoise and the Hare, most people approach getting in shape with the Hare mentality. They go out all guns blazing, intent on burning as many calories as they can and getting super fast results. But they’ve taken on too much, and it becomes overwhelming. They let their diet slip, they get bored, they become frustrated with the lack of results, and ultimately they quit. On the other hand you have the Tortoise, all they do is concentrate on improving one aspect of their day. They decide to walk 2,000 steps more per day. This could be from taking the stairs rather than the elevator. It could be taking their kids to the park, or maybe it’s just parking their car a bit further away from work than they usually do. These 2,000 steps extra will only burn around 100 calories, but that’s 100 calories per day, 700 calories per week, 36,500 calories per year. If you need to burn 3,500 calories to lose 1lb of fat then you will have burned 10lbs of fat over the course of a year, just by walking 2,000 steps more than you usually would per day. Once you have got used to the walking you could even add in some more exercise, or just increase your step count further to get even more spectacular results. Lots of training programs that are aimed at people with a short amount of time on their hands involve high intensity interval training. This is because it is a big calorie burner, can be performed in small spaces, and doesn’t take up too much time. 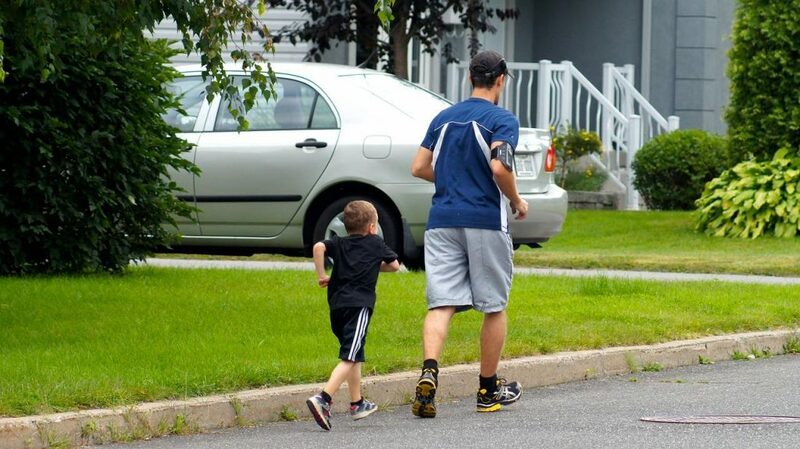 Of all the HIIT programs, TABATA is probably the best suited to dads who don’t have much time. Bear in mind that any HIIT program requires no injuries and at least moderate fitness. If you’re not there yet, then stick to tips 1-3. TABATA works like this, you split up a 4 minute time period into 8 x 20 second work intervals, and 8 x 10 second rest intervals. You exercise at a high intensity for 20 seconds, rest for 10, and then exercise again for 20. Alternating until the 4 minutes is up. You can theoretically use any exercise to complete a TABATA program, but not all of them are optimal. Any exercise that involves picking up barbells or dumbbells will fail because you’d spend all of your 10 second rest time dropping the weights and then picking them back up. Resistance machines are also problematic for similar reasons. That’s why bodyweight exercises are usually preferred. This also makes them perfect for dads who are training at home. Pick 4 bodyweight exercises, ideally have 2 upper body exercises (push ups, tricep dips) and 2 lower body exercises (squats, lunges) and 2 cardio exercises (Burpees, jumping jacks, mountain climbers). Then pick one from each, and complete 3 rounds of TABATA, one with the upper, one with the lower, and one with the cardio. This should take around 18-20 minutes all together. A single round will take 4 minutes and then you’ll have 2 minutes rest to recover, then you can move onto the next exercise, complete 4 minutes, rest, and then complete the final exercise. Alternate which exercises you perform each day. If you have the time, you could perform this as your morning routine. 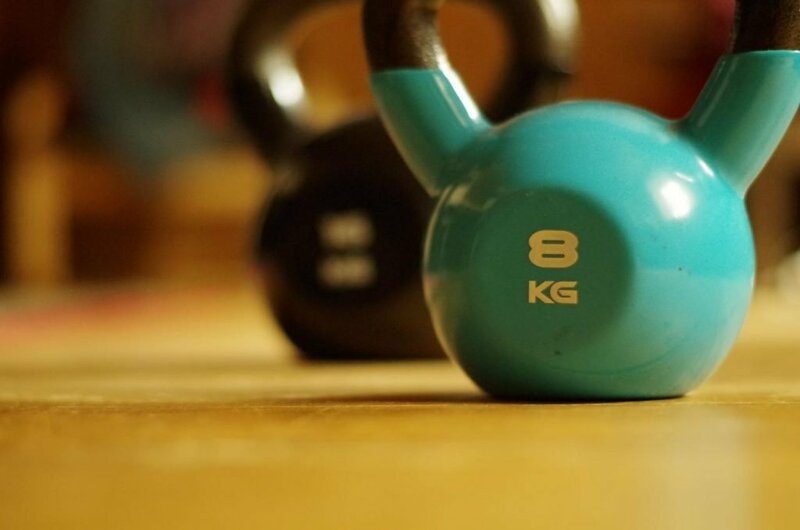 Obviously we’re talking about kettlebell swinging (why, what did you think?). This works great if you are a stay at home dad, or if you work. All you do is purchase a reasonably heavy kettlebell and place it somewhere in the house where you are likely to go past it a lot. Then, every time you see it you should swing it 20 times. You could place it near the bathroom, and conclude every visit with 20 kettlebell swings. This tip is similar to the walking one, in that the movement itself shouldn’t be too tiring. But the accumulated calories burned throughout the day will lead to long term benefits. Kettlebell swings will burn a lot of calories, help strengthen muscles in both your upper and lower body, and increase your growth hormone and testosterone levels. In many ways this is the perfect exercise for dads. Raising a family can take up a lot of time, and it may feel like you’re overwhelmed. That’s why the tips on this list are designed to be simple, quick, and effective. Prioritize sleep, walk more, perform short – sharp workouts, and you’ll be surprised at how great the results are. ← Why Subdivide Your Backyard?